A refreshment kiosk at the Masters’ Houses once again. The refreshment kiosk at the Masters’ Houses has been open for business again since mid-June 2016, after having been closed for over 70 years. Built by Mies van der Rohe in 1932 the kiosk survived the war largely intact, but for unknown reasons it was then demolished in 1962 and replaced by a fence. 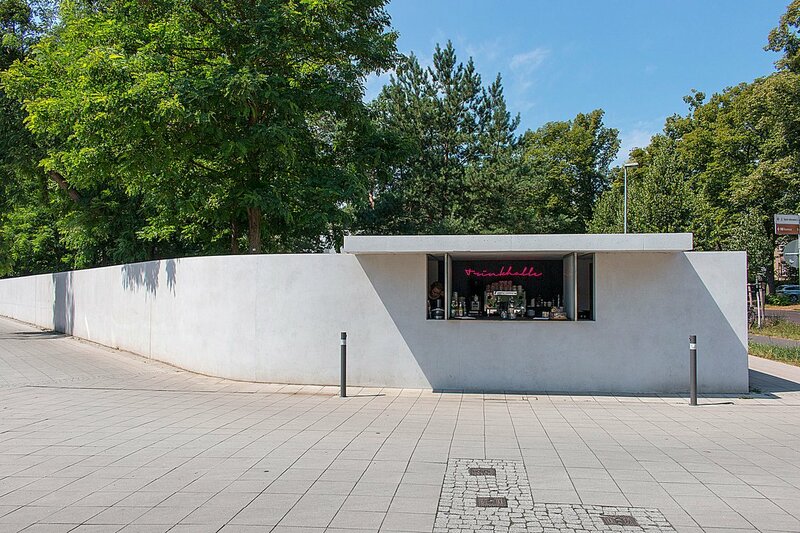 With the repair of the urban planning environment of the Masters’ Houses completed in 2014 by the Berlin-based architects BFM the kiosk also returned to the junction, reduced to its pure form in a contemporary interpretation. The kiosk has now regained its former function and, in the historic tradition, serves freshly-squeezed juices, homemade lemonade and speciality coffees on the weekends during the summer months, complemented by a range of tasty regional and international snacks. Thursday to Sunday, 12 – 6 p.m.